What’s better than playing a game of Roulette? How about playing 8 games of Roulette all at the same time! That’s right at Video Slots (Not available to Americans, but check out Roulette 5 at WinADay Casino instead.) you can do just that. And when you are playing 8 games at once you can win 8 X the amount of money on a single spin of the wheel and I don’t know of anybody in the world who doesn’t like winning more money. Multi Wheel Roulette Gold uses the French Roulette wheel and table. Racetrack bets as well as Call Bets also available. Good amount of features available in Multi Wheel Roulette as well as a great set of betting limits. There is an option to change the appearance of the tables, autoplay, save betting patterns plus much more. Multi Wheel Roulette uses Quickfire gaming software for a great looking and fast game of Roulette. It’s even more impressive how smooth and fast this game runs considering you can play on 8 wheels at once and the gameplay doesn’t lag or slow down at all. Multi Wheel Roulette Gold can be played at Video Slots (Not available to Americans, but check out Roulette 5 at WinADay Casino instead.) where their list of great Roulette games and Casino games in general is amazing. So as always your first step to get to play this great game is, well fairly obvious, go to VideoSlots. From there the layout of this casino is great and very easy to navigate. 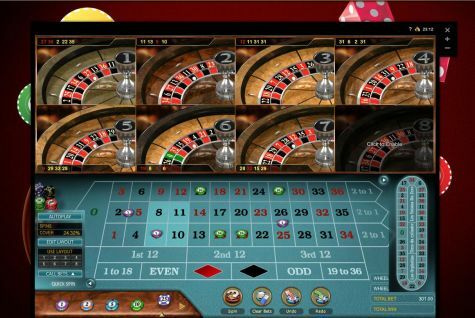 All of the types of games are listed along the left side of the main screen of VideoSlots and you will see Roulette. From there find Multi Wheel Roulette amongst the 12 versions of Roulette they offer. A good number of available features for Multi Wheel Roulette Gold which is always a good thing to keep the player happy but even more impressive that they have so many features for you considering the features apply to a game that has 8 wheels. Did I mention that this game uses 8 wheels? – repeat the last spin and wager one or two times. This version of Roulette is played the same way you would play any other version. To choose your wager amount select the roulette chip located to the bottom left of the roulette table which have the amount shown on the chip. To place a bet on a number or group of numbers place the chip directly on the number or group. Press spin when ready and s the ball lands in a slot that you havebet on then you win. To access racetrack betting click on the racetrack tab located under the wheel 8 window. The Call Bets can be found under the Expert menu tab located just above the wager chips . To activate the other wheels click on the window with the numbers 2-8 to open as many windows up to 8 that you would like to play on. All of the wheels are spinning at the same time and are all different so just because the ball lands in black 10 on wheel 1 all of the others wheels can land on a different number. To use autoplay click on autoplay but to adjust the auto play settings click on the options button below the wager amounts. To save a layout for future use, choose the edit layout button to open a new window which shows you a table where you can place chips including the racetrack. To save that layout as number 1, select the number 2 to open a blank table and continue on up to 8 times. A great game that runs and looks fantastic and offers players the potential to win up to 8 X’s as much money as they would playing on a single wheeled game of Roulette. Video Slots (Not available to Americans, but check out Roulette 5 at WinADay Casino instead.) is a great option for an online casino and they have some of the better version of Roulette that you will find on the internet. I personally think that 8 wheels is a fun way to play and all the included bets are another nice touch. But for people who are new to Roulette or for people who have no interest in playing on 8 wheels then there is no reason to try this game as VideoSlots has plenty of single wheel games that are fantastic. But if you want 8 X’s the excitement and chances of winning big bucks then give this game a try. Of course, it is not hard to play multiple hands in a game like video poker but is it possible to do so in roulette? The answer is yes, it is absolutely possible. Playing multiple hands in roulette had not been thought about in the past but if you think about it, you will see it makes all the sense there is in the world. In fact, it is the idea behind Multi Wheel Roulette Gold which brought multiple wagers in roulette to life. This game forms a part of the Gold Series by Microgaming Family. It is likely that you know very little about Multi Wheel Roulette but don’t worry; this article will outline all you need to know and how to play it with expertise. Microgaming is a superior online casino software company. Their Gold Series represents the highest level of quality in terms of player’s options and graphics in table games. Multiple wheel Roulette is a European style game with 8 spinning wheels, and betting options that range from $1-$50. It forms a part of the top tier Gold Series in Microgaming Casinos. It captures all the dreams and hopes players put in their numbers and wagers, by giving them a chance to bet on more than 1 reel at a time. Multiple wheel Roulette presents a great way to get more wagers across a table during a short period of time. What’s more, it makes doing so much easier than you might have thought. In addition, Multi Wheel Roulette Gold gives an extra dimension to your game by allowing you to activate up to 8 wheels at a time. All these wheels acts like you have placed a wager, and shows up on all the roulette tables you have activated. This theoretically enhances your probability of hitting any single number. If you have not played this game yet, it may surprise you to see the interface. It is basically a screen that has been split from top to bottom. On the bottom end, there is the game layout where you will click to place bets. This will be common across all the wheels that are in play. The top of the interface contains the wheels you have enabled split up on the screen. It is not confusing at all. You will not be looking at 8 different layouts but only the parts in which the balls fall in place. This gives you a very clear view of everything in just one place. There is great wisdom in designing the overall layout of the game, allowing you to see everything at a glance. Further, all you need to do to increase or decrease the number of wheels in play is to execute a single click. This game is awesome for you if you wish to play at a faster pace. After all, you can get a lot from wagering many times in a short period. If you are the type of person who likes to settle for one number and stick with it to death in all bets, this game is perfect for you. It’s not a bad deal for the casino as well, which ends up making more cash per minute or hour unless you are lucky to hit a very high number. To commence playing, you click the number of wheels you wish to play. You must then proceed and place a bet. There is a big number of different betting options open to you including placing a neighbor bet. If your are unsure about where to place a bet, you may use a call bet option, and the bet will be placed automatically. Once you are done placing a bet, click on the spin button to get the wheel rolling. Wait until the wheel starts to come to a stop. If the ball drops in one of the pockets on the wheel, you will have won and the amount will be shown at the top of the screen. However, if the pocket is one that you had placed, the amount you will have won will be shown in the win box. If you fail to hit a winning number, the play is over and you may choose to play again. Multi Wheel Roulette Gold is one of the most renowned online games there is. This is a micro gaming table slot that takes multi-tasking to a whole new level. This is because this game is played using eight roulette wheels on only one single table. The good thing about the 8 roulette wheels is the fact that when a bet is places, it multiplies your chances of winning. Multi Wheel Roulette Gold is therefore a game that keeps the player interested since there are many chances of winning compared to other roulette games. This game is based on the European type of roulette but is different in the number of wheels and bets. It is mostly played by very experienced players who wish to make very numerous bets in a short period of time. There are several things that make Multi Wheel Roulette Gold unique compared to other versions of Roulette. First and foremost, the game makes it possible for the player to make numerous bets within a short time compared to other roulette games. This is made possible by the 8 roulette wheels that speed up the game. With Multi Wheel Roulette Gold, there are very numerous chances of winning compared to other roulette games for the same reason. Last but not least, this game is unique in the sense that a player can choose a type of bet they want to make and increase their chances of winning since the bets and wins for this game are different. Multi Wheel Roulette Gold is not difficult to play. If you are a new player, it may help to click on the ‘help’ option. This will help you learn more about the game and know how it works. However, the main determinant of winning is luck. The game requires you to predict which among the numbers the ball will fall on. Once you predict the number, you are required to place your bet on this number. The pockets on the roulette wheel are numbered from 0-36. You are supposed to click the number of wheels to play with for each spin and select the chip size depending on what you are willing to bet. To the select the chip size, you should go to the chip selection area. The arrows are meant to reveal the other chip size options you can choose from. Once you have selected the chip size you require, the bet will be placed. Spin the wheel by clicking on the spin option. When the wheel begins to spin, the ball is dropped on it and the countdown unfolds. When the wheel stops, the ball will have landed on one of the pockets in the wheel. If the pocket is the winning number you selected, the win will be displayed. However, if you did not win, you will be required to try your luck once again. Multi Wheel Roulette Gold has a list of bets that a player can make. With this game, the player can decide which bets they want to make, how much they want to bet on and their chances of winning. A straight bet is the kind of bet that requires the player to make a bet on a certain number increasing the bet each time he or she plays until the number does not win. This type of bet wins 35:1. The split for two numbers wins17:1, the three number splits wins 11:1, the four number bet wins 8:1 and the five number bet wins 6:1. It is also possible to place a bet for six numbers. This wins you a 5:1. For the 12 number bets one gets to win 2:1. Multi Wheel Roulette Gold has a variety of chips to choose from which further increases the players overall chances of winning. The chips range from 1- 50. Therefore, every time you place a bet there is a very high chance of winning since there are eight wheels. This is one of the things that make Multi Wheel Roulette Gold different from other types of roulette games. It is also the reason why this game is considered variant on standard game. The fact that this game is easy to play and increases your chances of hitting the jackpot is the main reason why you should try this game out.